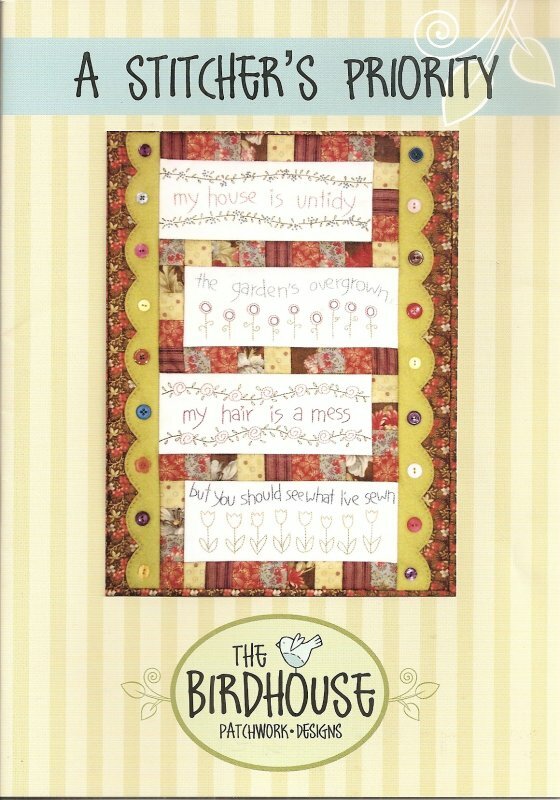 A Stitcher's Priority from The Birdhouse Patchwork Designs measures 13" x 17". Butterfly May by Kathy Schmitz. #5 in a series of 12. Measures 8" x 10". 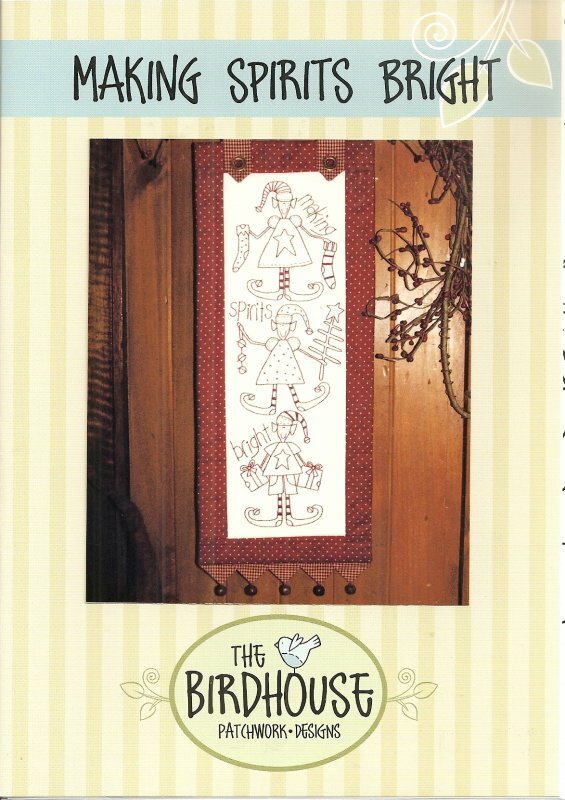 Christmas Angels from The Birdhouse Patchwork Designs measures 8" x 22" and includes pre-printed stitchery. Cottontail April from Kathy Schmitz. #4 in a series of 12. Measures 8" x 10". 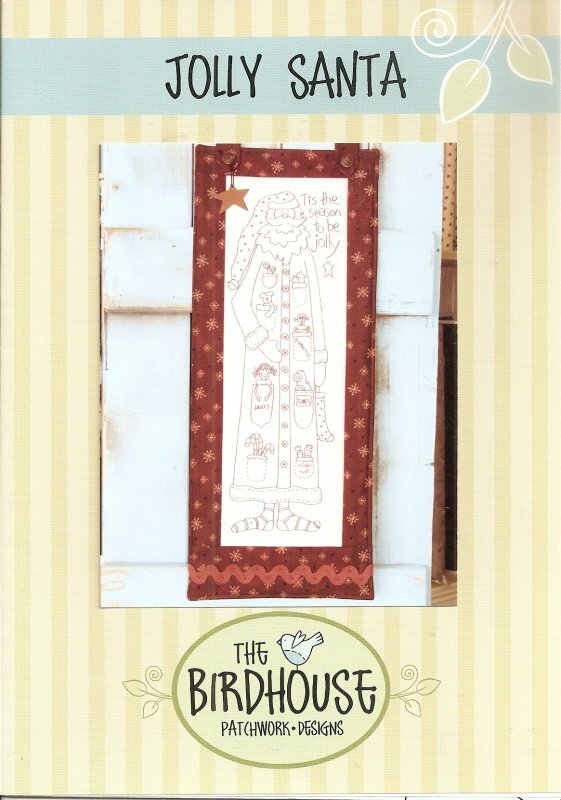 Deck The Halls from The Birdhouse Patchwork Designs measures 8" x 22" and includes pre-printed stitchery. Garden Glory August by Kathy Schmitz. #8 in a series of 12. Measures 8" x 10". 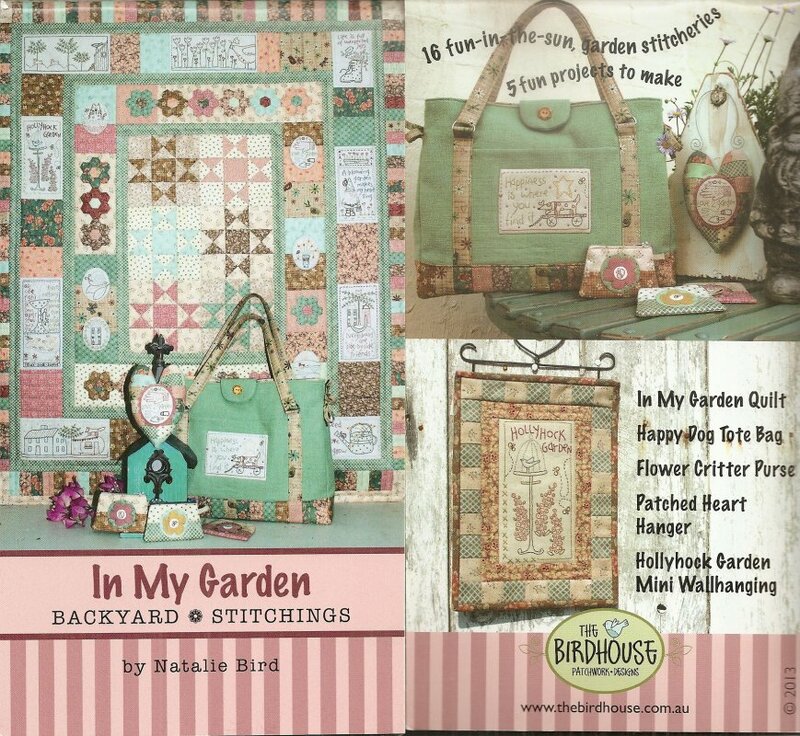 In My Garden Backyard Stitchings by Natalie Bird for The Birdhouse Patchwork Designs includes 16 fun-in-the-sun garden stitcheries and 5 fun projects to make. Ironing Board Cover pattern fits regular and antique boards. 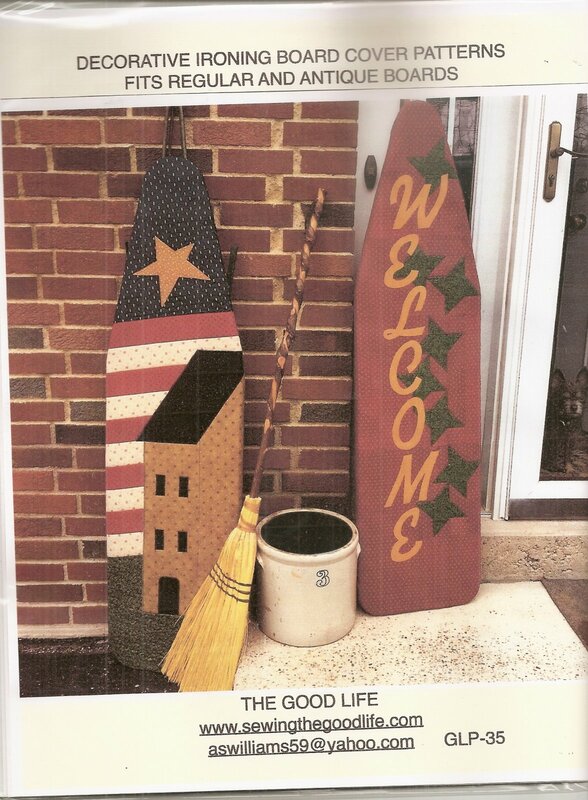 Includes Americana and Welcome. This is a great way to decorate your laundry room entry way or kitchen. And still use them by sliding them off and leaving a regular cover underneath. 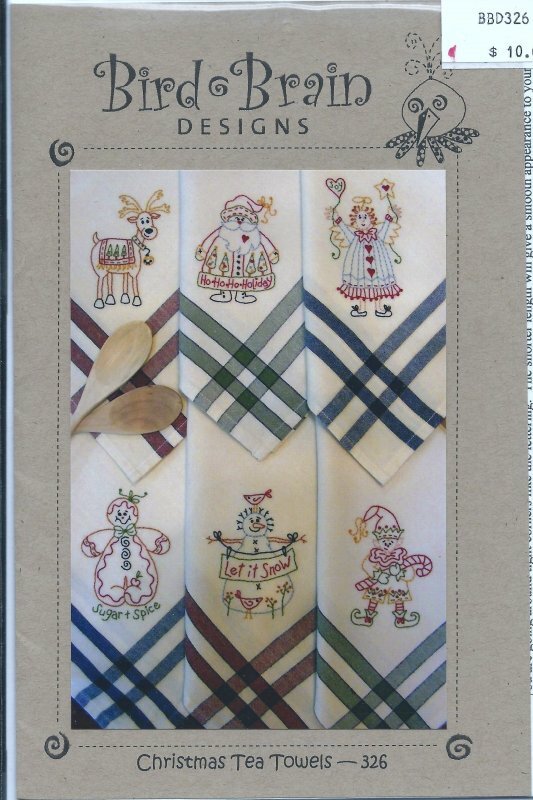 Jolly Santa by The Birdhouse Patchwork Designs measures 8" x 22" and includes pre-printed stitchery. 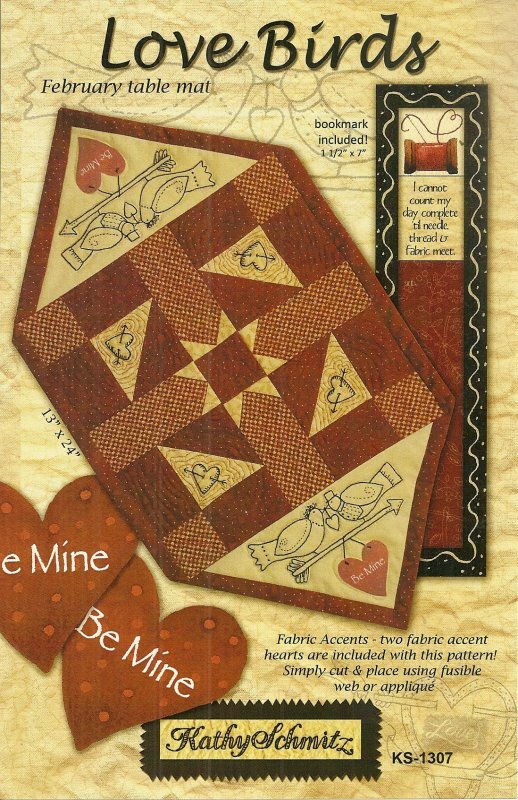 Love Birds by Kathy Schmetz is a hand embroidery pattern for a 13" x 24" table mat. Made By Me September by Kathy Schmitz. #9 in a series of 12. Measures 8" x 10". 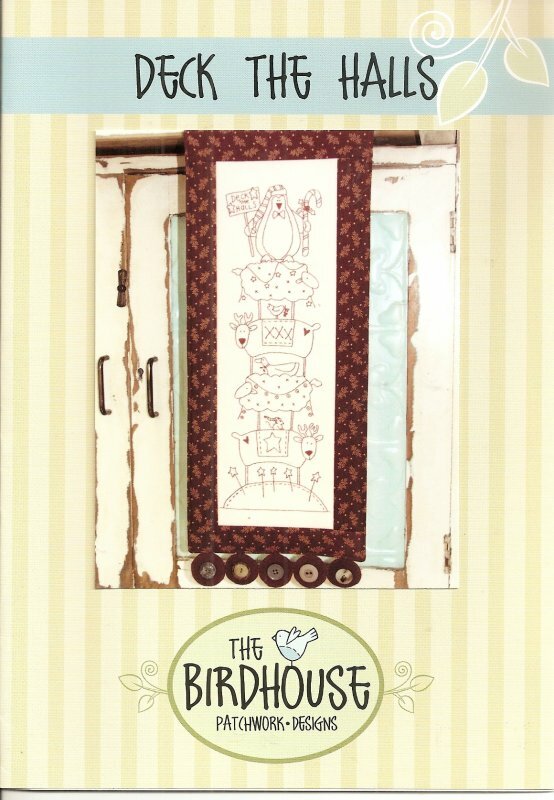 Making Spirits Bright from The Birdhouse Patchwork Designs measures 8" x 22" and includes pre-printed stitchery. Nest June by Kathy Schmitz. #6 in a series of 12. Measures 8" x 10". Peace At Home May by Kathy Schmitz. #7 in a series of 12. Measures 8" x 10". 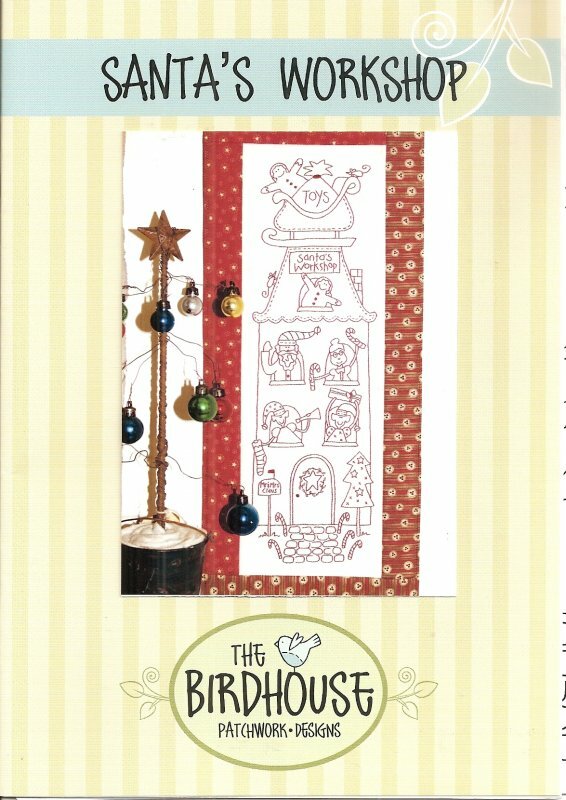 Santa's Workshop by The Birdhouse Patchwork Designs measures 8" x 22" and includes preprinted stitchery. 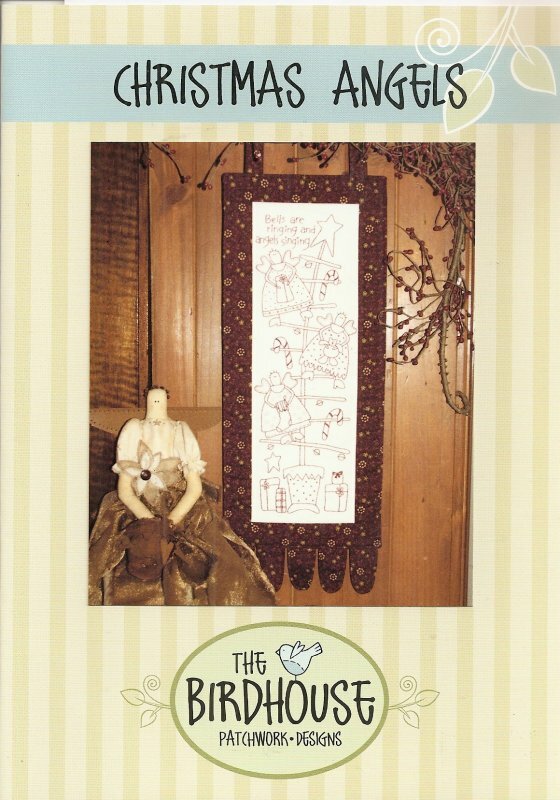 Bluebell Nest is a hand embroidery pattern by Kathy Schmitz. 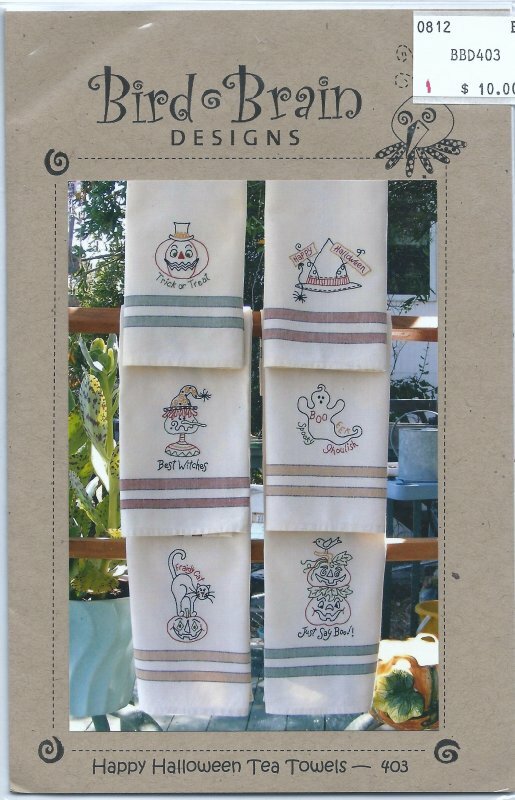 'Happy Halloween Tea Towels' is a hand embroidery pattern by Bird Brain Designs. It has 6 designs. 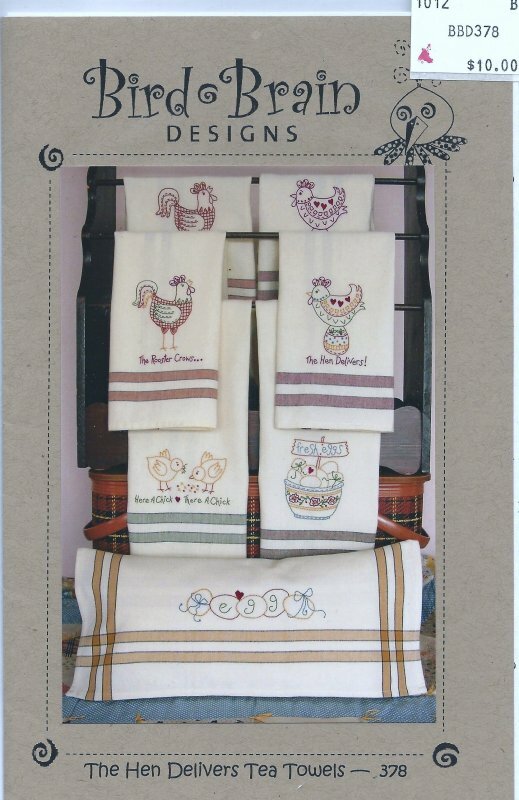 'The Hen Delivers Tea Towels' is a hand embroidery pattern by Bird Brain Designs. It has 7 designs. 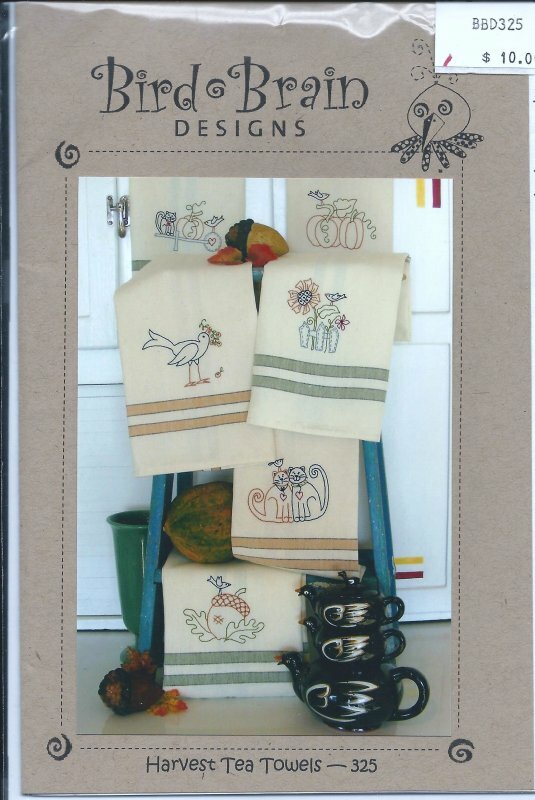 'Kitchen Helpers Tea Towels' is a hand embroidery pattern by Bird Brain designs. 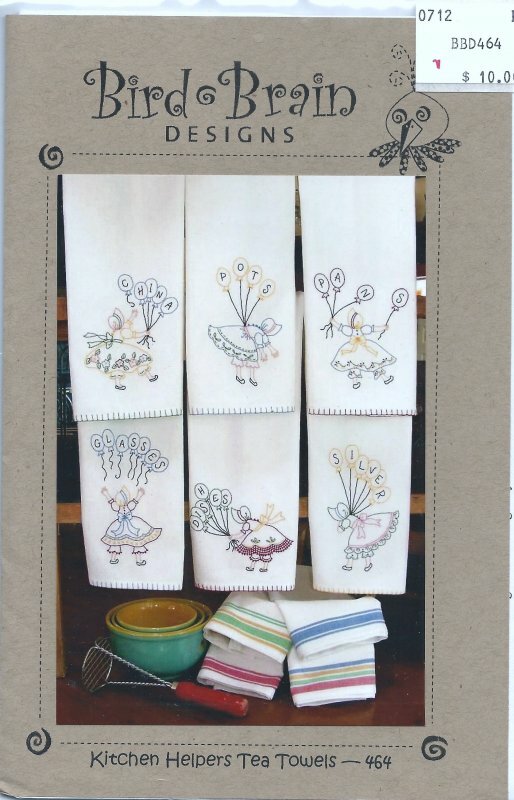 There are 6 pretty little ladies in vintage look for a set of towels. 'May Day' is a hand embroidered pattern by Kathy Schmitz. It finishes at 13 x 15".